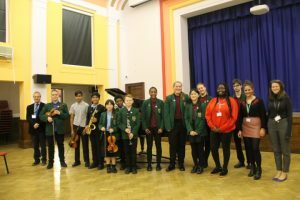 On Wednesday 7th of February Sydney Russell Schools finest musicians went head-to-head to compete for the title of Young Musician of the Year. It was a tough competition and the judges, Mrs Lindsay and Elise Curran struggled to make final decisions on who would be given the title of Young Musician of the Year! The competition was so tight that the judges wanted to commend additional performances, so a special well done goes to Chloe of year 7 and Chyanne who received special mentions from the judges for their beautiful performances. The overall competition winners were: Timothy in year 7 for the beginners category. Timothy played an exciting rendition of Bare Necessities on the alto saxophone. 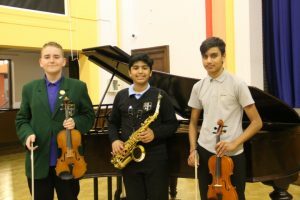 Nir of year 11 won the senior category after playing a sensitive performance of Idylle on violin by Edward Elgar. Musical excellence award was given to Rejus for what was a moving and beautiful performance of John Williams’ theme from Schindler’s List. Once again well done to all competitors! !